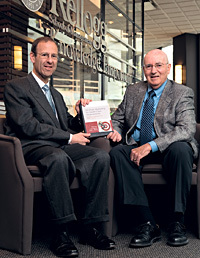 Marketing is the lens through which Kellogg Professors Philip Kotler and Joel Shalowitz '82 examine the healthcare industry in their new book. The text, Strategic Marketing for Health Care Organizations: Building a Customer-Driven Health Care System (Jossey-Bass 2008), offers detailed steps that practitioners can take to apply marketing frameworks in a variety of health contexts — including hospitals and physician practices, as well as in the pharmaceutical and biotechnology sectors. The book has received praise from healthcare experts, including Harvard Professor Regina Herzlinger who calls it a "tour de force." Shalowitz, a physician, is also professor and director of Health Industry Management. Kotler is the S.C. Johnson & Son Professor of International Marketing. He is widely acknowledged as one of the world's preeminent marketing scholars, a fact recently underscored by his being named among the top business thinkers in a survey conducted by The Wall Street Journal. The ranking, based on Google hits, media mentions and academic citations, placed Kotler sixth among an array of internationally influential figures, including CEOs, writers and educators.